"TO MUCH JELLY FOR ONE BISCUIT"
If you're around Jimmy Dugger very much and something good happens, you're likely to hear him say, "That's too much jelly for one biscuit!" To translate, there's so much good going on we just can't hold it all! That's what happens every time you put your real estate transaction in Jimmy's hands, because there's never too much service he can give you on any transaction. Jimmy is dedicated to helping you solve the puzzle of Real Estate by keeping you informed throughout your transaction. From listing to sale, from your first property viewing to closing, you've got a great asset in Jimmy's attitude and ability. Jimmy will handle your business with PRIDE. Keeping your business simple and representing your best interest is at the core of Jimmy's idea of working for you. His background in Maury County and the whole state of Tennessee gives him an edge when bringing buyers and sellers together. While serving the State of Tennessee with the Public Service Commision, Jimmy specialized in solving people's problems. So when you think about buying or selling Real Estate, think first about biscuits and jelly. After all, when it comes to your transaction, you'll definitely want "too much jelly on your biscuit!" P assion Jimmy Dugger has a passion to serve you in a professional manner. His attention to detail and his ability to communicate, combined with his knowledge of the area make him a true professional on your side in any transaction. 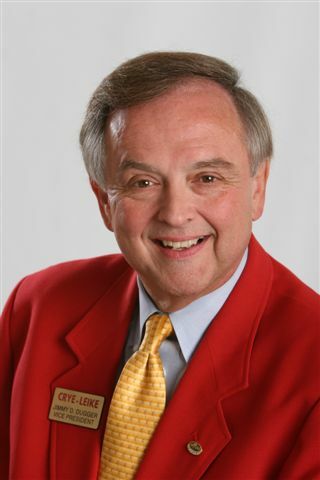 R esources For over 20 years Crye-Leike, REALTORS has been a Real Estate Leader in Tennessee. Those years of experience, the tremendous strength of having state-wide offices, and a staff of people who deal with the latest technology and with clients in a positive, productive manner give both you and Jimmy the edge you need. Integrity Trust is the most important factor in any business dealing. You can trust Jimmy to put your interests first and keep you informed about what's really going on. Diversification With a large base of contacts, from all walks of life, Jimmy may already know the person who is looking to complete your transaction. A working knowledge of business, the community and people help Jimmy do a better job for you. "I'm Jimmy D, come list, sell and buy with me!"